And so after almost 2 weeks, we bid a sad farewell to our wonderful woofers. They leave behind well dug and composted beds planted with previously pot-bound plants and a variety of vegetable seeds; piles of collected cow dung and compost heaps, painted and varnished decks and a rhino-boarded children’s room. It is actually quite unbelievable that these tasks (which loomed and weighed on my consciousness) could be swiftly completed by such fantastic new friends in exchange for tented accommodation and some food… if this is the alternative to capitalism, I’m all for it! 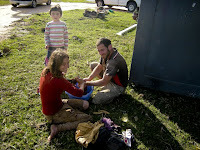 We shared a potjie around the fire on their final evening, accompanied by our builders and lovely neighbours. I listened to Thomas (our landlord/neighbour) and Goldie (the woofer) playing guitar under the stars and felt humbled and grateful for the Universal order of things. How things always seem to turn out perfectly in spite of our plans. 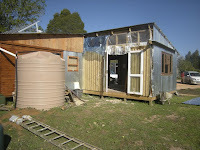 The house is nearing completion and is coming together quickly now with finishing, plumbing and electrics. I still can’t quite believe that after 2 years of planning/hoping/praying/obsessing we will finally be living on the land and a new chapter of our rural integration will begin. I have rearranged my working hours so that I work 6 hours instead of 7.5 at 80% of my pay. With eliminating a lunch break, I now finish at 2 pm and gain 2.5 hours of daylight. This has opened up an entire chunk of the day to spend playing cars with Luke, sewing Barbie dresses with Mila and communing with my plants. 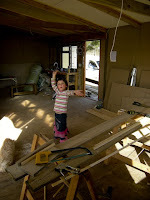 Mila had her 6th birthday party recently – also a “goodbye” party for the house we’ve called home for the past 2 years. Organising a birthday party without the help of my mother was very daunting but ultimately empowering. Following in Papa Tony’s footsteps, Mila has become quite the equestrian, while Luke (in keeping more with my ancestral line) is rather obsessed with cars and swear words (which he calls “square” words!). As soon as he returns the packing will start in all earnest as we prepare for our homecoming. Much has been happening on the farm. I arrived yesterday to find a digger loader preparing a large hole for our septic tank, the final walls on the house raised and our new WOOFERS painting and preparing vegetable beds. I had never seen so much action on the farm at once – it was rather overwhelming but thoroughly exciting! Our wonderful WOOFERS (Neta and Goldie) arrived a few days ago after spending some time at the Kula Dharma eco-community in the Eastern Cape. With all the woofing requests over the past months, I lost track of who’s who and so I was expecting some tough German girls, but they turned out to be a delightful Israeli couple from a Kibbutz near Haifa who can teach me a thing or two about farming! We provide them with food and “luxury” tent accommodation (and dry toilet) and in return they get onto all those jobs that I haven’t been able to. Kevin also has someone to share humus and Hebrew jokes with. Kevin had a very successful exhibition in Johannesburg and is off to do the Whale Trail tomorrow after which it’s Cape Town and another exhibition, so he’ll be missing out on some of the action on the farm. We’ve been spending a lot more time on the farm and it’s really starting to feel like home – the kids have also started painting their room and constantly want to know when we’re moving in. Our rent runs out at the end of October so we’ll be in our new little house before then! After 2 years of uncertainty, it’s quite unbelievable that things are finally coming together.